1) Do we have a mobile solution which works on all devices (PC, laptop, smartphone, tablet) and platforms (Apple, Android, Windows)? 2) Are your field products offline enabled? If you answer is no to either or both questions … you need to act fast! GIS and asset management technology are developing rapidly. You need to move quickly your competition are working on this TODAY. Seriously. Just visit esri.com, for example, and read about their new releases. Times are changing quickly. Asset management is about to get easier for users. That means you have some work to do. Asset management and field mobility go hand in hand. The world has become mobile-centric. iPads, iPhones, Galaxy tablets, Surface Pro’s. Sure organizational adoption rates vary, but a combination of laptops and mobiles are standards among field staff today. You need to have a mobile strategy and products which allow field staff to use one application on ANY DEVICE, anywhere and anytime. And you are already behind your competition. We can help. We can fast track the evolution of your asset management solution to provide full mobile capabilities. How? 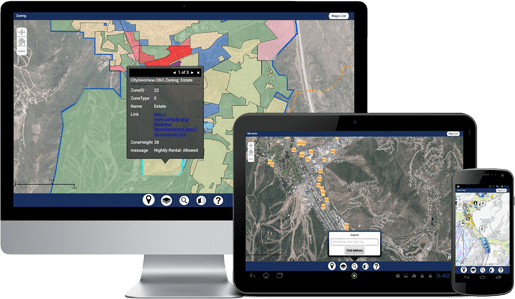 1) Our configurable map viewer allows you to build lightweight cross-device, cross-platform web applications which work against your asset management platform, for any field based team across any organization. It leverages ArcGIS, and is built using widgets. These are lightweight tools which can be added in any combination to any mobile application generated with our configurable map viewer. Simple. 2) Field mobility is plagued by problems with wireless connectivity. Poor or no wireless connectivity is a huge challenge. Not anymore. We have built an offline solution which allows any application built with our configurable map viewer to work offline. There you have it. We can provide you a full field mobility solution which integrates with your existing asset management system. Get a jump on your competition. Better still blow them out of the water. Contact us for more information. Call Matt at 801-733-0723. This entry was posted on Thursday, April 2nd, 2015 at 1:53 pm. You can follow any responses to this entry through the RSS 2.0 feed. You can leave a response, or trackback from your own site.